Announcement I especially love beach jewelry with ocean water colors and feeling, Irish jewelry with its Celtic knots, and modern pieces - all created using sterling silver, pearls, and crystal elements. Need more than you see listed for your summer wedding or bridesmaids gift? Feel free to contact me and I'll be happy to work with you on larger quantities! Please note that international orders (outside the US) can take 2-6 weeks for delivery, depending on customs. While most items will arrive somewhere in the middle of that time frame, the delivery time is out of my hands as I have no control over the customs portion of the shipping. Please keep this in mind when ordering items for international delivery. UK CUSTOMERS: Please note that you may be required to pay the following for importing goods: VAT is payable by UK customers if the goods are over £15. VAT is charged at 20% on both the value of the goods and the shipping, plus a Royal Mail handling fee of £8. I especially love beach jewelry with ocean water colors and feeling, Irish jewelry with its Celtic knots, and modern pieces - all created using sterling silver, pearls, and crystal elements. I have purchased several of these earring pairs. Grreat small size and perfect for gifts. 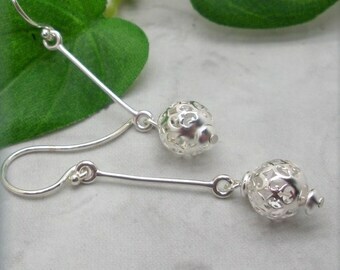 Will match the earrings for my wedding perfectly. Thanks! Envoi rapide , article expédié dans une belle boîte cadeau . Belle qualité , prix abordable. 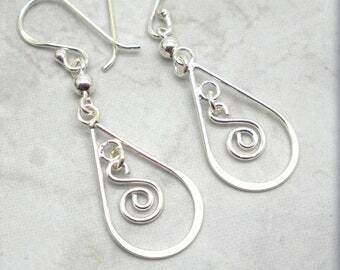 Love all the detailed swirls and wire in these filigree style earrings! Experimenting with earrings - I love the fringe look! Working on setting some new gemstones - love the sapphire! My great grandmother chose my name - Bonny - as well as the unusual spelling. She loved that it meant "pretty" or "beautiful", which was her outlook regarding all of her grandchildren and great grandchildren (I just happened to be lucky enough to get the name to go along with it). Bonny Jewelry came into existence because of my love of simple jewelry that can be worn everyday. I don't believe in "waiting" to use the good china, wear the nice perfume, or enjoy the nice jewelry. Life should be celebrated - and this means enjoying all of the special things in your life. One of my favorite poems is "When I Am an Old Woman I Shall Wear Purple" by Jenny Joseph. Do an internet search for this, read it, and you'll understand my philosophy about life. I am genuinely thankful (and surprised) that my jewelry is purchased by people all over the world. Having an online shop has allowed me to help contribute to my family's finances, as well as have a creative outlet. I strive to provide a great item at an affordable price using quality materials. The biggest compliment is having customers contact me to let me know how much they love the piece(s) they bought. Thank you does not convey how grateful I am for all of the support that I have received for my shop. Lover of dogs, flowers (especially lilacs), thunder storms and beach walks. It still amazes me that my jewelry has been purchased by people all over the world. Doing something I love and being able to sell it is a dream come true! VAT is the responsibility of the buyer who is bringing goods into the country. Please note that UK customers may be required to pay the following for importing goods: VAT is payable by UK customers if the goods are over £15. VAT is charged at 20% on both the value of the goods and the shipping, plus a Royal Mail handling fee of £8. I ship items in a pretty blue cotton lined box (non-tarnishing cotton) with a silver ribbon wrapped around it. If you would like to include a short note, please add this information into the Note to Bonny Jewelry box when you checkout. Receipts are not included unless requested. All items are shipped within 3 business days (sometimes sooner) unless there is a question about your order or a different processing time is otherwise noted in the item details. I ship via USPS first class mail, with Priority mail also available as an option upon checkout. Please note that Priority mail shipping does NOT impact the processing time of your order (the time needed to make your order). All items will have tracking information, which will be sent to the email address on your order. All of my jewelry is .925 sterling silver, unless otherwise noted in the listing. Sterling is a particular grade of silver; it's an alloy typically made up of 92.5% silver and 7.5% other metals, usually copper. Oxidization (tarnish) will occur if item(s) remain in packages or are untouched for a lengthy amount of time. 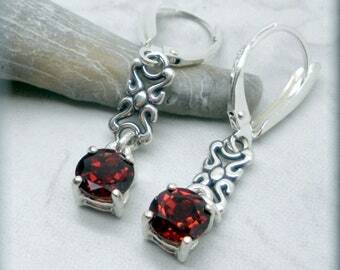 Oxidization is a natural chemical reaction and is normal for sterling silver. To slow the oxidization process down, store your jewelry in a small ziplock bag with antitarnish strips. Wear it often. Do not wear your jewelry while cleaning, swimming or taking a shower as chemicals such as ammonia, bleach and chlorine in water could cause tarnishing. Air, humidity, moisture, perfume and hairspray can also cause tarnish. Please note that each item that is handstamped is done by hand - not machine. There will be slight variations in depth of letters and spacing, which is perfectly normal. This only adds to the beauty of handmade and makes each piece unique and unusual. As metal stamping moves metal (instead of shaving it away), there is a slight impression on the reverse side of the stamped piece. 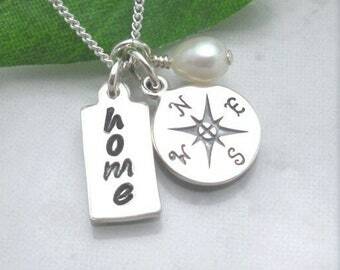 Can I add on additional charms or birthstones? Additional charms (year, initial, birthstones, etc) are all available in my shop in the Add On Charms section.